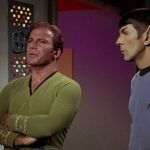 Parallel Arm VS Regular Arm: Which Closer Do You Need? Door closers that are surface mounted generally have two or three methods for installing them at the opening. The most common two are the parallel arm and the regular arm. So which closer arm do you need? 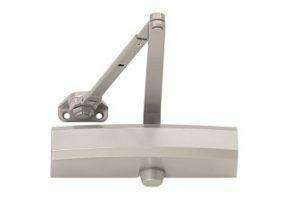 Door closers with regular arms are usually mounted on the pull side of the door, where the closer body is mounted to the face of the door and the closer arm is attached to the face of the frame at the head. 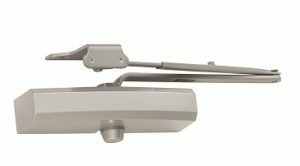 Regular arm door closers allow doors to travel up to 180 degrees. The closer arm also noticeably sticks out perpendicular to the door and frame. Learn about the different types of closers. 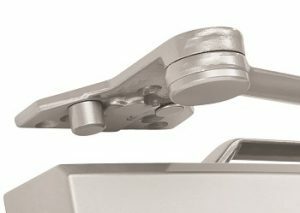 Because of the way regular arms are made and installed, there is little extra functionality that can be added to control the opening. 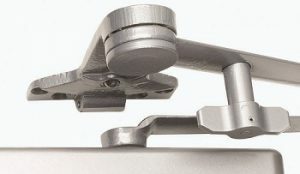 Friction hold open closer arms are available in addition to the standard closer arm. Many regular closer arms are available with an attachable shoe that converts it from a regular closer arm to a parallel closer arm making it easier for the installer to place the closer where the end user wants it. A regular arm will have slightly more leverage in effectively closing the door than a parallel arm. 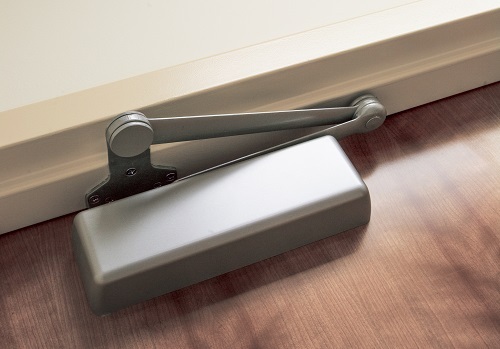 Parallel arm door closers are less noticeable because of the way they are installed. The closer body is installed on the push side of the door and the arm is installed to the soffit on the head of the frame. The parallel arm folds in so that it is parallel to the face of the door. Many parallel arm closers allow doors to travel up to 180 degrees. Because of the way the parallel arm travels as the door opens, stops and hold open functions can be added into the arm and shoe of the parallel closer arm. Stops can be a dead stop or a spring stop. Hold open functions can be friction type or a ball catch with a thumb-turn for added control. 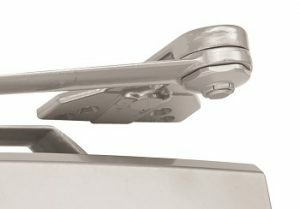 While parallel arm closers are slightly less efficient in closing the door than regular arms because of the way they are mounted, they are able to function effectively for most applications. 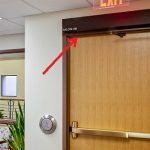 Regular arms are beneficial for mounting the closer on the least public side of the door and can do the job of controlling the opening. 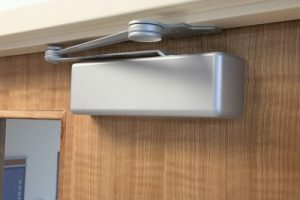 Parallel arms are excellent for not only keeping the door closed but for additional control such as heavy-duty arms to withstand more abuse, as well as door stops and hold open functions. Parallel arms can still be used at the more public side of doors if needed because they have a less noticeable arm due to the way it folds parallel to the face of the door. These are only two methods of mounting closer hardware. Many other options and designs are available such as track arms, concealed closers, and floor closers. Functionality and appearance are both considerations when selecting the closer arm you need.